North Carolina beer featured prominently in national media outlets when Charlotte hosted the Democratic National Convention, including Raleigh-based Lonerider Brewing crafting the “official beer” of the CNN Grill. The CNN Grill — a full-service, invitation-only restaurant CNN operates alongside the conventions. The campaign called for something thematic in the names of CNN brews on tap. As the host of the Democratic Convention — renominating Nobel Peace Prize winner Barack Obama — you could get bottles or draughts of Peacemaker Pale Ale displayed prominently behind the CNN Live Stage. 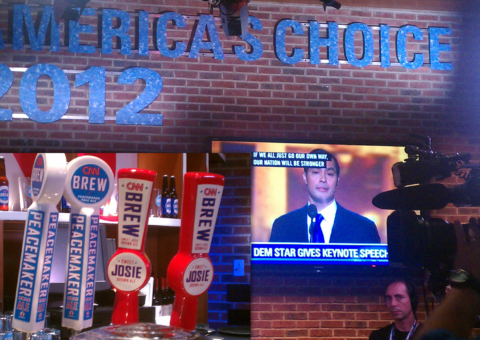 A beautifully displayed wall of beer bottles and complimentary tap handles adorned the main bar of the CNN grill. We achieved brand visibility with prominent show hosts, politicians, celebrities, and thousands of patrons over the length of the convention. World of Beer started in Westchase a suburb of Tampa, FL which grew quickly after its inception in 2007. The focus was more than only beer. We created an a place where everyone felt welcomed: an upscale bar with a down home feel. We were able to build the GM training program from the ground up as well as the team member beer school training. Systems and training were key to the initial growth of World of Beer. We developed a priopriary inventory system with developers who worked with Price Waterhouse Cooper. Under our direction we opened 18 World of Beer locations. The Grand Opening event for the location in South End, Charlotte, NC broke the opening night sales record. WOB – Southend was the number one trending location in US for beer. Quadrum Fitness Center is a full-service designer gym promising fitness in a different experience. We were tasked with website creation of their brand new multi-studio high-end fitness facility. The owners at Quadrum Fitness Center needed their messaging and branding to be reflective of their vision; where fitness meets innovation! Quadrum Fitness offers an experience for everyone with a variety of State-of-the-Art Equipment, Signature Classes inspired by professional athletes, and Revolutionary Cloud Technology to help you train and track your workouts. They aren’t your ordinary gym! Experience fitness differently with quality surround sound and a display of concert lighting, creating an array of colors from sky blue to sunset orange contrasted by the bright green 8’ palm trees. Sandstone wooden benches enhance the experience throughout, creating a juxtaposition between the natural outdoors and interior spaces. Every room offers heart monitoring to help you get the most out of your workout and each machine contains a call-service button where their experienced trainers on staff are just a push of a button away. We developed a series of promotional videos to help tell the Quadrum Story. Their signature classes and personal training programs are developed by professionals with over 30 years’ experience in the health and fitness industry. Train on your own or meet new friends at the high-energy group classes, each studio provides a different experience; from fog machines to strobe lighting, the signature classes are designed to give you a great workout while providing an experience that meets any gym need, from combat training to yoga practice, Quadrum welcomes you to…fitness in a different experience. An Ahvanguard concept designed to provide a craft beverage experience as part of a lifestyle brand in St. Petersburg, FL. The brand is designed around the need of young professionals. The brand promise is to deliver high quality coffee, tea, beer and wine with using locally sourced ingredients for the entire food menu. The brand is designed to accomodate the business professional or for leisure. The Tampa Bay Buccaneers were looking to launch a campaign for a 5K run to raise awareness and funding for breast cancer research. We ideated and created a custom logo for the Treasure Chests 5K Run/Walk that represented the vision and maintained brand standards. The registration fee includes a ticket to the Breast Cancer Awareness Philadelphia Eagles vs. Tampa Bay Buccaneers Game that same day. The Treasure Chests 5K Run/Walk had thousands of supporters on the inaugural event and continues to run annually. Some additional creative content included, Suite advertisement on the Tampa Bay Business Journal, as well as the Owner’s Suite Gift, a commemorative game day high-quality book. Managed food and beverage programs at Ruth Eckerd Hall and the Capital Theatre. During this relationship the organization accomplished a multi million dollar renovation of the Capital Theater and Ruth Eckerd Hall, driving concessions and catering event increases of 40%. Part of this increase was due to renovation and innovative promotion of special events and fundraisers. Received the Most Creative GM of the Year awarded from Spectra by Comcast (2014). Spectra Operates more than 140stadium and arenas in North America. CEO ZevBuffman said “Brandon’s…dedication, ability to learn so much, plus his calm leadership ability bodes well for Ovations (Spctra by Comcast) and their attention to new clients. Brandon is a game changer!”. The goal of the campaign is to recruit prospective adoptive parents (PAP) who may not yet have thought about adoption as well as prospective donors & volunteers. This ad series was/is used throughout Pinellas & Pasco counties on social media and print media with the potential for state-wide usage. ahVanguard takes pride to work with Charitable 501(c)3Organizations. We believe in giving back to the community which is why we donated our time to this amazing organization. Teenagers make up the majority of children waiting in foster care for an adoptive family. Every child deserves a home. Learn more about older adoption at HeartGalleryKids.org. Charlotte’s 13th annual “Fight Night for Kids”, a fundraiser that benefits sick children in the area, raised over $40,000 for The Ronald McDonald House. Over 800 people attended the black-tie event held at Charlotte’s Convention Center. WBTV Anchor Molly Grantham was the emcee. Sugar Ray Leonard fought in an exhibition bout at the end of the charity fundraiser. at the forefront of your business.